As we edge closer to WWE Hell in a Cell 2017, it seems that the WWE Universe is pretty peeved by the fact that there are only two matches taking place inside the Cell on Sunday. While the members of The Usos and The New Day all make their debuts in only the third-ever Tag Team Hell in a Cell match, there are two people for whom this won't be their first appearance. Kevin Owens makes his second appearance inside the iconic cage while Shane McMahon steps into it for the third time in his career. But, which superstars have made their careers out of this illustrious match? That's what we're here to find out today. We start the list off with three legends of the professional wrestling business. Shawn Michaels, John Cena, and Mick Foley have all entered Satan's Structure four times, and all of them with wildly varying consequences. Michaels has won three out of his four matches as the most successful of the trio, while John Cena has won two. Foley, on the other hand, has not won a single one of his matches inside Hell in a Cell. 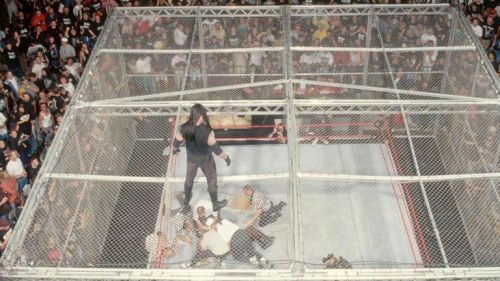 But, of the three men, it is Mrs Foley's Baby Boy who commands the most memorable moment when he was thrown off the top of the Cell during his match against The Undertaker.